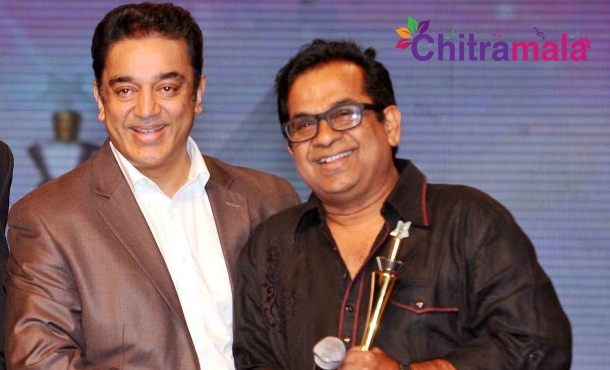 Star Telugu comedian Brahmanandam has been roped in by Universal hero Kamal Hassan for his yet-untitled trilingual project, which is being made in Telugu, Tamil, and Hindi. The film has tentatively titled as “Amma Nanna Aata” for Telugu version. Apart from Brahmanandam, Kamal Hassan’s real life daughter Shruti Hassan and yesteryear top actress Ramya Krishna will also be seen in important roles. Brahmanandam’s role is said to be one of the highlights of this comedy. Earlier, Amala Akkineni was supposed to act in this film, but Ramya Krishna replaced her. The film directed by Kamal’s assistant Rajeev Kumar and Ilaiyaraaja composing the music. The film also marks the first collaboration of Kamal and Shruti Hassan. Kamal Hassan is also bringing back one of his most well-received characters in this film. Kamal did not reveal which character he will be bringing back to tickle the funny bones of movie lovers.